Bf 110C-2 serial number 3057 crashed Aalborg West 20/4 1940. T/o ? Op: Transfer flight. The Bf 110 crashed during landing at Aalborg West killing Pilot Feldwebel Helmut Pirch and wounding the bordfunker. 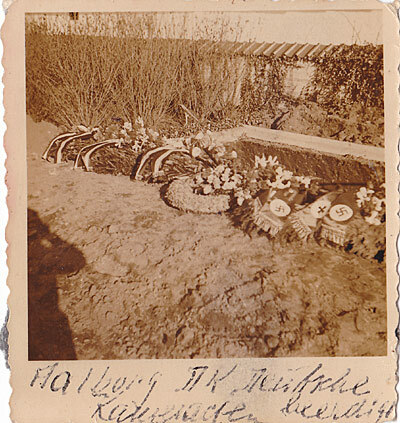 Feldwebel Pirch was laid to rest in Lindholm cemetery on 22/4 1940 with the German Reverend Götler of Emden officiating at the graveside ceremony. The remains of Pirch was in the late sixties transfered to Grove cemetery. The aircraft was 60% damaged. Sources: Lindholm cemetery protocol, RL 2 III/884, JJ.